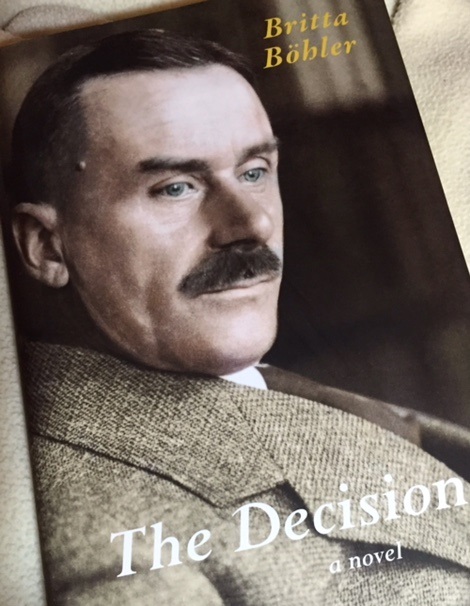 The German author, Thomas Mann, lived for three years in self-imposed exile from his German homeland as the Nazi regime grew more powerful and influential. Mann never spoke publicly against the Nazi regime during this time, but during a three day period in early 1936 circumstances forced him to decide whether he would speak out or remain silent. Britta Bohler dramatizes Mann's possible thoughts as he wrestles with this historic decision in her short novel, The Decision. Mann struggled with a complex array of doubts and fears. He was a German who wrote in German for a German readership, upon which he was financially dependent. He had a Jewish wife and a Jewish publisher. He did not arrive at his decision to speak out in an orderly fashion, but in a messy human way, with fear often driving his thoughts. "[H]e always remained a musician in his writing. Music is the prototype of all art. The form of the novel is nothing but a composition in words, a symphony of ideas. A work of counterpoint, an ensemble of contrasts and harmony." "What does it mean, a home? A country, a city, a memory?" "... train travel. The slow passing of the world, the gradual changes in the landscape that prepare the traveler for his arrival in new surroundings." In one scene, Mann is looking out at the night sky and thinking about the speed of light and how the stars shining there may no longer exist. He is doing this instead of attending to work related tasks. I could relate. It is so much more fun to think and wonder than to work. It was details such as these that gripped me while reading The Decision and the only real complaint about the book that I can make is that I wanted more. I wanted more about "the gap between being an artist and bourgeois life," and "the artist as a pure spirit" with a mystical "cast of mind." Britta Bohler is no stranger to the struggle between individuals and governments. She is an international human rights lawyer who has defended individuals against the abuse of governmental power and, as such, brings a unique outlook to this three day period in the life of Thomas Mann. I don't know a lot about Mann, but the book has a ring of authenticity and is a psychologically convincing look at a man agonizing over a decision that would cut him off from his homeland and put him at odds with an abusive regime. "There is so much in a life that is not lived."